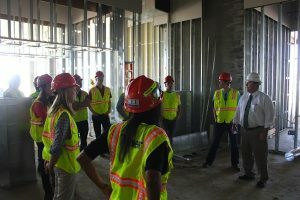 Our afternoon trip of the first day commenced with a Brinkmann Constructors office visit in Aurora, CO. After a delicious lunch by our host company, we were eager to sit in on a presentation by Dave Rahm, Dustin Graul, Lucas Rottler, Lindsey Wenzelman, and Kylie Ayala. The first portion of the presentation focused on company overview and operations. Following this was an overview presentation on the Wind Crest Erickson Living Retirement Community project. Due to the focus on creativity instilled onto employees by CEO Bob Brinkmann, Brinkmann engages in mainly design build projects. The company has 2 office locations but has had projects in 30 different states. Brinkmann gains a competitive advantage in the construction industry by seeking unique solutions to problems that their competitors have not been able to solve. 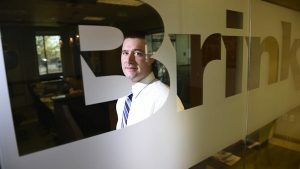 As a result, Brinkmann sees 75% repeat clients. 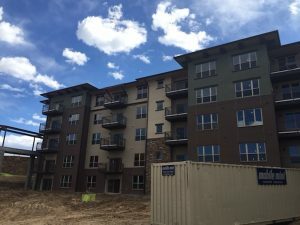 In addition, the company is experiencing rapid growth; the Denver office has doubled in size in just the past two years. One unique aspect that differentiates Brinkmann is that there is no formal estimating department. Rather, this role is carried over to the project managers who are in charge, amongst other things, of bidding out new projects, carrying out estimations, change orders, and close outs. This holistic approach results in more knowledgeable project managers that are more familiar with industry costs. The next part of the presentation was an overview of the wind crest retirement community project. This project consisted of Wind Crest neighborhood one, Wind Crest buildings 2.1-2.4, a community building, and an enclosed pedestrian walkway. The enclosed pedestrian walkway is the longest walkway in the state of Colorado. Wind Crest neighborhood one was the only portion done by a contractor other than Brinkmann Constructors. Currently, wind crest 2.2, which is pictured above, and the community building are under construction. In July, construction on wind crest 2.3 will commence. Eighteen months after the start of wind crest 2.3, construction will begin on the final building, which is the wind crest 2.4. After the presentation in the office concluded, our group went on a site tour with our host company. First, we visited the $30 million expansion, which consisted of two new residential buildings; namely wind crest 2.1 and 2.2. Wind Crest 2.1 is an independent living center that is a part of the second neighborhood. This building is complete and comprises mainly of apartment units with some common spaces. Wind Crest 2.2 is about 95% complete and will be turned over in about 5 weeks. What makes this project unique is that it utilizes a Hambro joist system, which is a floor system, composed of steel joists and a concrete slab reinforced with wire mesh. This floor system carries both gravity loads and lateral loads. In addition to apartment units, this building will have a library, landing salon, and office space. Both of these buildings are 4 stories, with the lower level being metal stud framing and the top three being wood framed. One of the issues in constructing building 2.2 was the ceiling height. The project team needed to coordinate MEP trades in order to properly route ductwork and other piping through the limited ceiling cavity space. Another challenge was maintaining the firewall rating of the wall joining buildings 2.1 and 2.2. Our site tour ended with a visit to the construction site of the community building, shown above. 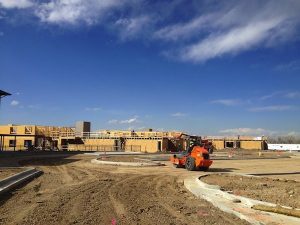 This building will have catering areas, dining areas, office area, a life enrichment center, and will serve as a centralized hub for the residents of the Wind Crest Retirement campus. The framing for the lower level of this building is made up of metal studs while the upper two levels are wood frame. One challenge the project team ran into for this project was that the framing was divided into smaller components. As an example, one subcontractor did not handle all of the framing activities. This was one of the challenges the project team overcame in order to ensure successful completion. Upon completion of the Wind Crest site tour, our first day in Denver was officially over. We learned a lot from a full day of site and office visits.